When it comes to feeding a cat, there are few things as frustrating as trying to put them on a diet. House cats love having their food available to them whenever they want. Wireless Whiskers has created a new way to solve this problem, using technological advancements that no other company has used, as of yet. With the help of a new sensor, they make it easier than ever to feed your cats on a schedule. What Makes This A Great Cat Feeder? Automatic cat feeders come in a variety of shapes and sizes, but this model in particular stands out for a number of reasons. There are too many features to cover in detail, but a few things stand out more than others. The timer that is used in this automatic feeder is far and away the most advanced in any you are going to come across. 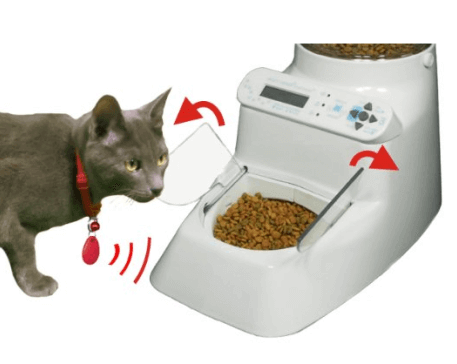 The timer used here has the ability to be tailored to fit different cats that you have and set up a feeding schedule of up to 24 feedings a day. This also means cutting off your cat when a certain amount of food has been dispensed. 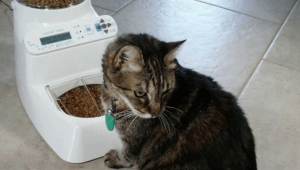 With the help of wireless collar tags, this feeder can not only feed your cats, but recognize individual ones and give them their own feeding. When the right cat approaches the feeder, it will release the food that you have determined is just right for them. The Autodiet Wizard records statistics for each cat, showing you how much they have eaten and making it possible to change anything as needed. 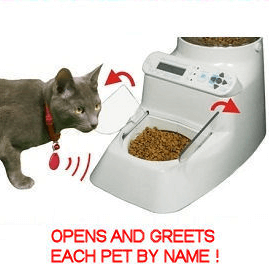 Even better, the wireless collar will greet each cat by name when they approach the feeder, which is especially helpful if your cat can read. The hopper of this automatic cat feeder is capable of holding around 5 pounds, which means you’ll be able to set the timer and forget about it. You won’t have to fill the hopper on a daily basis. That alone makes this a great option for busy people, although if you have a large number of cats this might not be enough. One of the biggest signs that there dis a problem with your cat is that it isn’t eating enough. That is why the Wireless Whiskers feeder will give you an alert any time that your cat is eating too little. Once you have set the amount that it is meant to eat each day, the feeder will continue to measure and see if it hasn’t been by the food bowl recently. Overall, there aren’t many shortfalls, but there is one concern that some people have when it comes to the Wireless Whiskers automatic feeder. The price can seem like it is a lot to pay for an automatic cat feeder. Paying over $100 for a cat bowl can seem like a problem, but is that really a large price to pay for a way that will automatically feed your cats on a schedule? A steady feeding schedule will keep your cat healthier than ever, while taking the stress off of your shoulders. If you have a large cat, you might find that they can get around the locking feature and get to the food, but that isn’t always going to be the case. Most cats aren’t going to be capable of getting into it, so it isn’t a major concern for most people. The hopper is capable of holding around 5 pounds of cat food. The feeder can be powered by either plugging in the power supply or batteries, making it versatile and capable of fitting wherever you need to place it to feed your cats. Extra tags can be purchased from WirelessWhiskers.com for $12.99 each. The feeder comes with two wireless tags included in the package. With the ability to purchase extra tags, you can accommodate three different cats with this automatic feeder. Up to 8 cats can be fed with this single feeder. 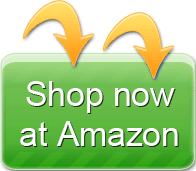 At the end of the day, you have hundreds of different automatic feeders that you can choose between. How many of those have the kind of automation that the Wireless Whiskers pet feeder does? The technology packed into this feeding system makes it a stand out option, but you should now have enough information to make up your own mind about it. At the very least, it is worth another look if you have passed up on it in the past. We bought this feeder awhile ago. From about the second month this feeder has never kept time. Now it is allowing the cat to eat 40 minutes a day vice the 18 minutes we had it set to. I asked the company to send me a new PC board, and he wanted me to send it back to him at my cost, it was 2 months past the 90 day warranty. I was not happy with it costing me more money for something that does not work. Great product if it would hold the time and date and not allow the animal to eat more that what it was initially set for. Poor quality on the electronics side of the machine. Even worse on the warranty of 90 days for the electronics. Overall, I would buy a different brand. Anyone want a P.O.S. cat feeder that doesn’t hold the settings more then a couple hours? Our cat broke into it with one day. They have an abysmal return policy and will not take it back.